Sibling Rivalry BRRG Poster - io design & illustration, inc.
Yeah, I love creating posters for the Blue Ridge Rollergirls (BRRG)! When Drag’n SlayHer told me the theme I immediately pictured two young girls being, well, as sisters can be, bratty. Perfect for my children’s book illustration style. So, some time at the drawing table, some coloring on the computer, some fun with type and a poster came to life. Well, actually two – one tabloid size and one letter size (shown). Want to know more about BRRG? 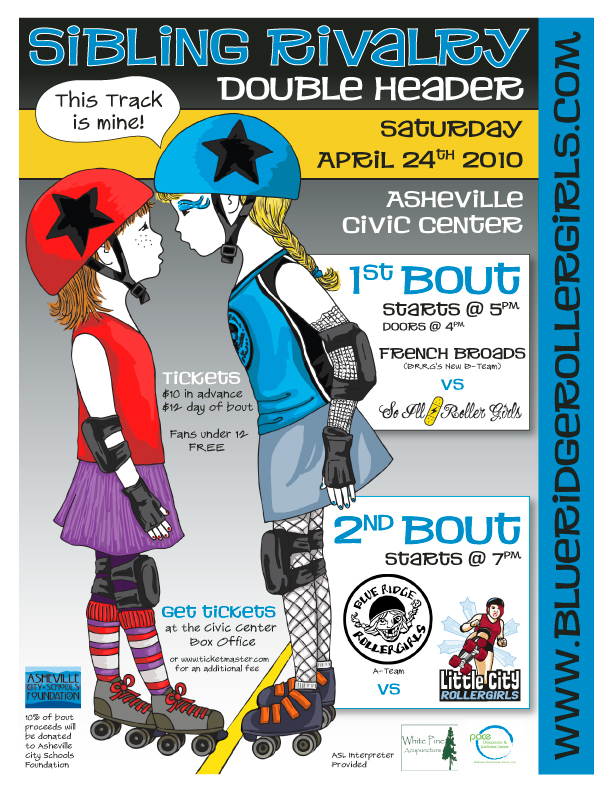 Visit them online at www.blueridgerollergirls.com and come out to the bout on April 24th. I recommend picking up your tickets early, saves you some $ and time in line, giving more time for cheering. And for you fans out there, who do you think was the inspiration for the young BRRG?